If you haven’t had a chance to play the hottest new mixed poker game on the internet, 7 Game Poker, now’s the time for you to saunter on over to PokerStars (the only site with active mixed game tables) and register for a free account. This game is a hybrid mix of seven of your favorite poker games all rolled into a sweet little package that many poker enthusiasts are calling their favorite mixed game. 7-Game poker (or HEROSHA) is made up of fixed limit rotations of Holdem, Seven Card Stud Hi/Lo, Razz, Omaha Hi/Lo and Seven Card Stud – with No Limit Texas Holdem and Pot Limit Omaha thrown in for good measure. Each game is played ten times in succession – making it one of the exciting mixed poker games on the planet. The 7 Game Poker rules are simple. Just playing the following games with a rotation. Those players who are accustomed to playing limit holdem will definitely need to make some careful considerations when playing fixed limit Holdem in the rotation on PokerStars. What you’ll see – more hands will be shown down, more tables will be loose and passive, and there will be a lot of recreational players who are fattening up the pot. The best way to play is to raise early and build a good pot – and follow up by chasing draws all the way to the showdown. Fast and furious play in this leg of the 7 Game mix will get you everywhere. Because it takes an eight or better to qualify for the high in fixed limit 7 Card Stud HiLo, lots more players will be going for the high instead of the trend of building on the low. The smart player, however, knows that the real hand in this game is one with an ace – so strive for that hand to be more profitable and to up your game. You should always be trying to win the high or low and hopefully split the other. Scooping the pot or winning 75% is where you will make money in this game. What you want in Razz is a low hand only – and don’t forget that straights and flushes don’t count. The ace is considered low – so building a hand that starts with ace and ends with five (also known as a wheel) is what you’re looking to do here. Watch the other cards at the razz table carefully – if you see several go through that you’ll need in order to build your hand up the way you’re planning to – then you should fold by fifth street and save your chips for the next one. Three things make a good fixed limit Omaha HiLo hand. Nut potential, possibility for two ways to play the hand, and you want your hand to be counterfeit proof. Also, you want to bet fast and hard if you are lucky enough to get this type of hand – and then just sit and watch your bankroll expand. Keeping a close watch on what’s being played is the most important part of fixed limit Seven Card Stud, which is the fifth rotation in the 7 Game Poker mix. Cards that have been folded will also be useful in determining your strategy during the game. Also, keep an eye out for that extra round of betting – and make your decision to call based on that. You’ll find a lot of passive and slow playing opponents when playing no limit Texas Holdem – so use that to your advantage. When playing the no limit Texas Holdem rotations in 7 Game Poker, pay close attention to pot control and position, and temper your play with aggressiveness. 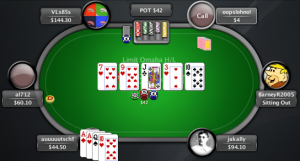 Drawing to the low end of a straight or a paired flush will be your downfall in pot limit Omaha, which is the final game in the lineup of 7 Game Poker. Don’t over-value the cards that you have in your hand, either. Play a big range of hands in this game and get ready to be super aggressive if you get a hand that looks like a true winner.